Engagement Rate is an invaluable metric that allows brands to monitor how well they engage their audience over social networks. But how do you calculate the perfect engagement rate for your Page? Once you have figured out the Engagement Rate for your page, benchmark it against the global and industry standards found in the charts below. The larger the fan base a page has, the more challenging it is for them to engage their audience. This means that admins of larger pages need to create even better quality content so that fans will interact with it. 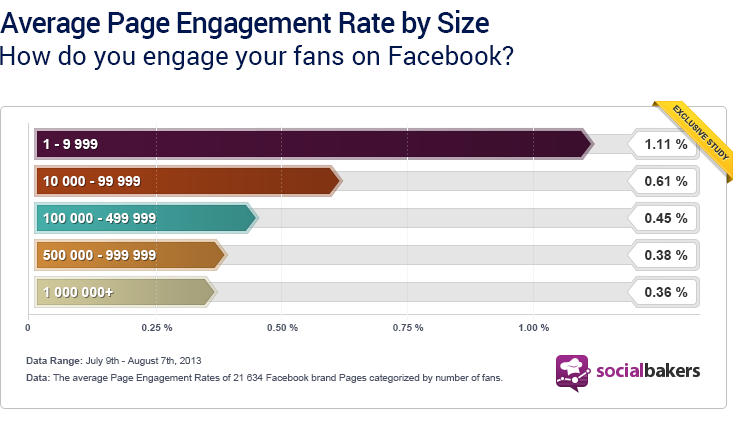 We measured the average Engagement Rates of brands from differing Facebook page sizes to determine the global standard. As you can see, it becomes difficult for pages with 1M+ fans to share their posts with large amounts of fans. Brands with smaller fan bases have an easier time reaching the fans they have, but this is no excuse for not trying to create the best content possible to help build a larger fan base and keep fans connected to the brand. Where Does your Brand Place in your Industry’s Standard? Once you have calculated your page’s Engagement Rate, you can see where you rank in your industry by comparing your percentage with those in the chart below. It is important to benchmark your performance against your competition to determine whether your brand is being effective in social media. 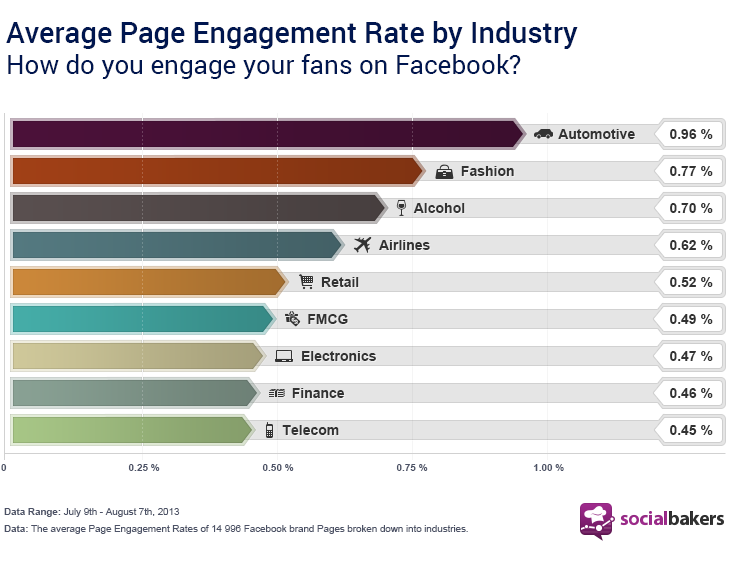 The Automobile Industry comes in first with a .96% Engagement Rate! Automotive brands perform remarkably and companies from other industries should strive to engage their audiences as well. You can monitor your brand’s performance with Socialbakers Analytics. Why not start your free trial today? This time we've compared brands and media performance throughout the UK. Find out which types of posts are most successful, which brands and media are most engaging, and how you can adopt these strategies in order to bolster your relationships with your fans. To engage your fans, you need to post enough content but not too much at the same time. Is there a magical number for the ideal number of posts on Facebook?